Mr. Van Loenen is a civil engineer, specialised in the application of ICT in water resources management. He has experience in designing, developing and implementing systems for operational water management, such as flood forecasting systems, real-time control systems, and sewer optimization systems. 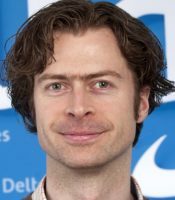 Since joining Deltares, Mr. Van Loenen has participated in many projects where the Delft-FEWS system was implemented or extended. In these projects Mr. van Loenen acts as project leader and consults clients on how to implement operational systems, always in relation to the client’s context. He has furthermore participated in expert panels advising on the procurement of operational systems for water management. Next to performing consultancy projects, Mr. Van Loenen is actively involved in exploring new techniques for improvement of operational water management, such as information distribution via internet, application of mobile apps and mining social media. Thanks to winning in the 2014 in-company Innovation Contest at Deltares, he was able to perform a practical research in the use of Twitter messages to generate real-time flood maps. System Integration and Technical Assistance for Strengthening of Weather Forecasting and Early Warning Systems in Vietnam. Main project features: Design of an integrated Early Warning System for Vietnam. Main project features: Updating and checking system performance of the operational flood early warning system. Adding new functionality and capacity building. Brabant Flood Early Warning System 2.0. Main project features: Development of a second generation Flood Forecasting System, in which the interacting water systems of four regional water authorities are integrated. Main project features: Development of an institutional framework for optimizing water management, by improved cooperation of water authorities and application of RTC modules. Main project features: On-going deployment and improvement of the Operational Management System for Regulated Water Systems. Project management, implementation of real-time control modules for two water management districts, application support. Main project features: Development of a first-phase operational data collection and flood forecasting system for Yom River. Main project features: Upgrade of the existing flood forecasting system of Jakarta into an all-round Flood Management Information System. Main project features: Implementation of WANDA model of waste water systems, that in combination with monitoring data calculates the performance of the sewer pumps. Main project features: Expert advice on procurement of an operational system for correcting and distributing precipitation radar data for use in operational water management. Main project features: Pilot project in which telemetry systems of sewer systems from different communities in Hoeksche Waard are connected and displayed in favour of improving water quality. Implementation of Real-Time Control Tools for optimising sewer operation and application of SOBEK Urban for urban water system analysis. Implementation of a Flood Management Information System for Jakarta. Short-Term optimization of a canal network for navigation and water management. Nooyen, R.R.P. van, Kolechkina, A.G., Loenen, A. van. (2012). International Congress on Environmental Modelling and Software, Leipzig, Germany. Loenen, A. van. , Mol, B. (2011). International Water Week 2011, Amsterdam, The Netherlands. Verkade, J., Loenen, A. van, Weerts, A., Leeuwen, E. van. (2011). H2O. nr 16, October 2011. Risc communication concerning flood safety (in Dutch). Van Loenen A., Reichard H.L., Van Iersel P., Slikker J. (2006). H2O Nr. 18, November 2006, p. 92 - 93.